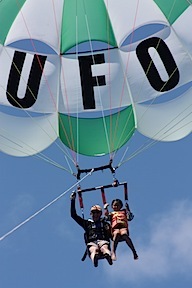 I just took my daughter parasailing in Hawaii. Several days before, I spent a ton of time researching whether there are ever accidents and if I was the worst dad ever for thinking of taking my nine year old daughter on a ride a couple hundred feet over the Pacific. The more I read, the better I felt though. Accidents like the one described here, which is about as horrible as they come, appear to now only happen outside the US, where there are few if any controls. I would never think of parasailing in Mexico, for example. The day of, we spent about two hours waiting for the winds to calm down so we could take our turn. More accidents do happen when conditions are bad enough to think about canceling but aren’t severe enough for local entrepreneurs to shut off the money machine. I was reassured that this team had a perfect safety record. Our ride went off without a hitch, and all I could really complain about was the nausea that started to intensify after sailing around for 15 minutes. At a certain point, you just want down. It’s hard not to think about every ten seconds about the possibility of this happening: the harness breaks or the chute is punctured and you fall like the proverbial stone. It isn’t really that ironic that this poor guy was just saying what would happen, because, when you’re up there, it tends to be what you talk about because it’s always on your mind. Sad story. All I can say is that I’m glad she wasn’t just a little girl like mine, though the tragedy is just as horrible. My little boy is six and now wants to try it. Maybe next time, it’s my wife’s turn. Dad Glenn Hudson was happily tandem parasailing with his daughter Emma when he joked at 150ft they would be goners if their harnesses snapped. Tragically, just moments later, the very thing Glenn had laughed about happened – as his harness broke and he hurtled helplessly to his death after hitting the beach.